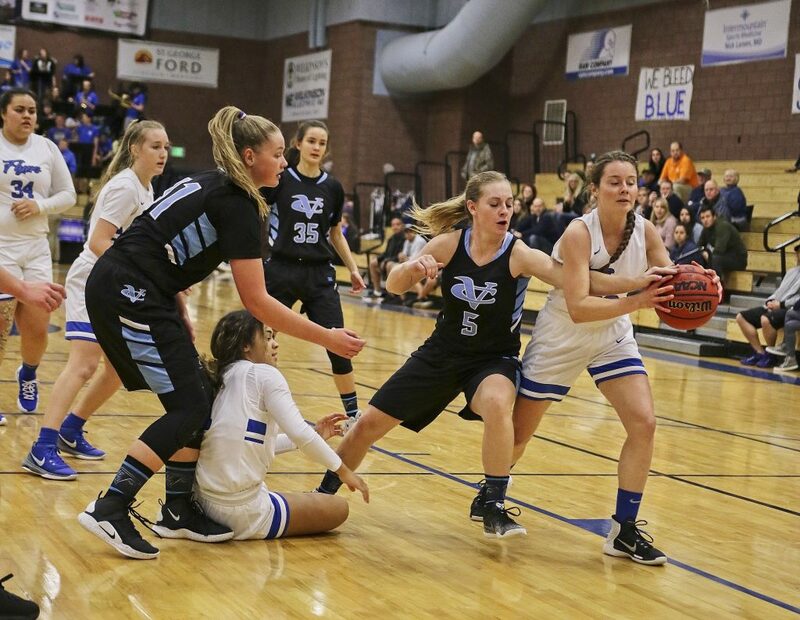 ST. GEORGE — The Region 9 season hit the halfway mark Tuesday night with all three home teams posting victories. 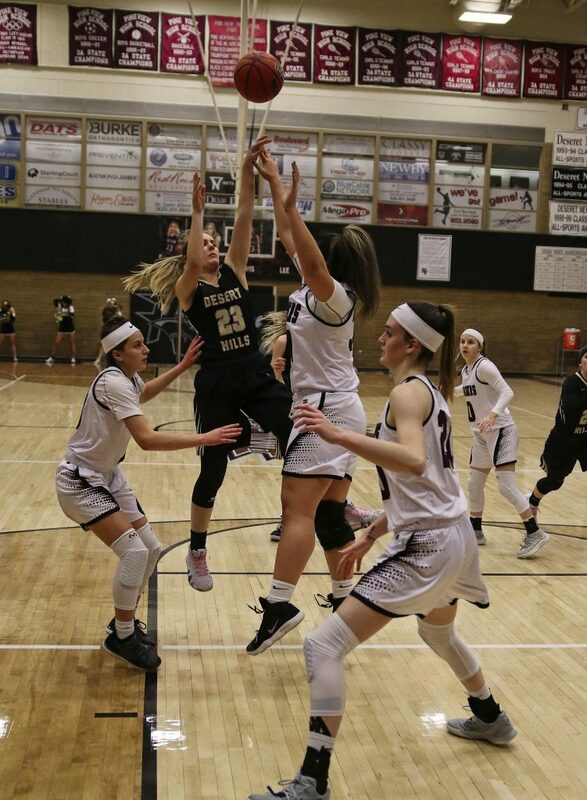 Pine View picked up its first region win, beating Desert Hills by four points, while Dixie defeated Canyon View by the same margin. 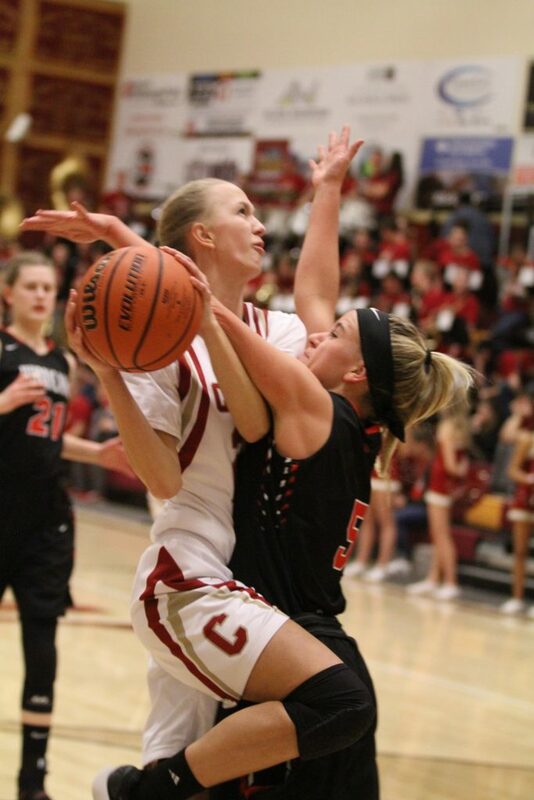 Meanwhile, at Cedar, the Lady Reds stayed unbeaten with a 15-point win over Hurricane. 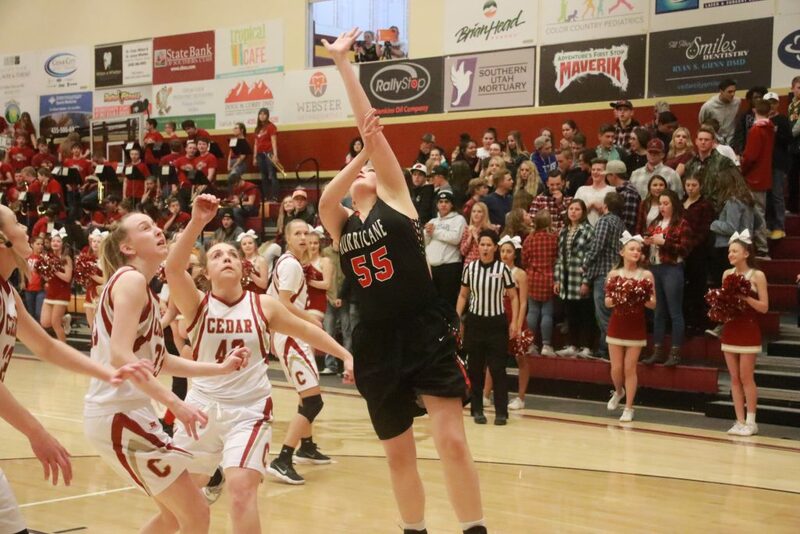 With the Region 9 season now half over, the Cedar Lady Reds are still unbeaten, thanks to a 51-36 home victory over Hurricane. 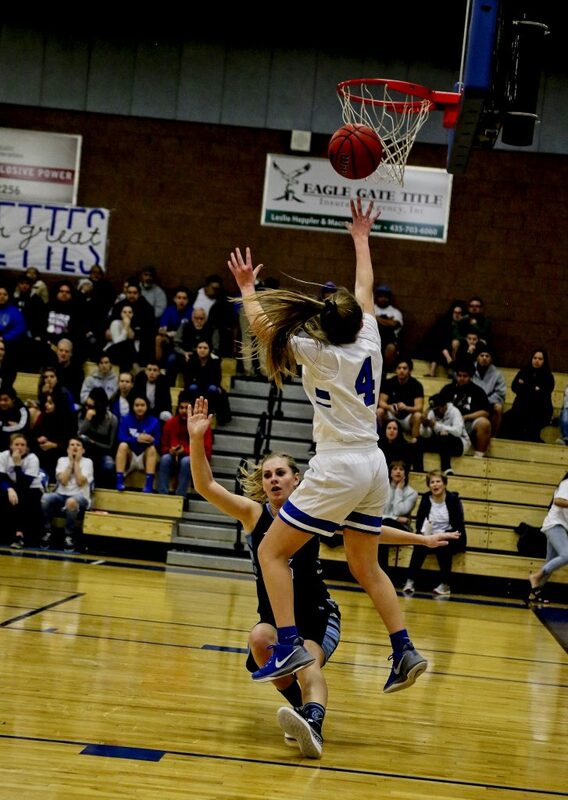 Hurricane’s only lead of the game came on an early basket by Bryn Erickson that put the Tigers up 4-3 with 6:15 left in the first. Cedar then went on a 14-4 run to take a 17-8 lead at the end of the first quarter. 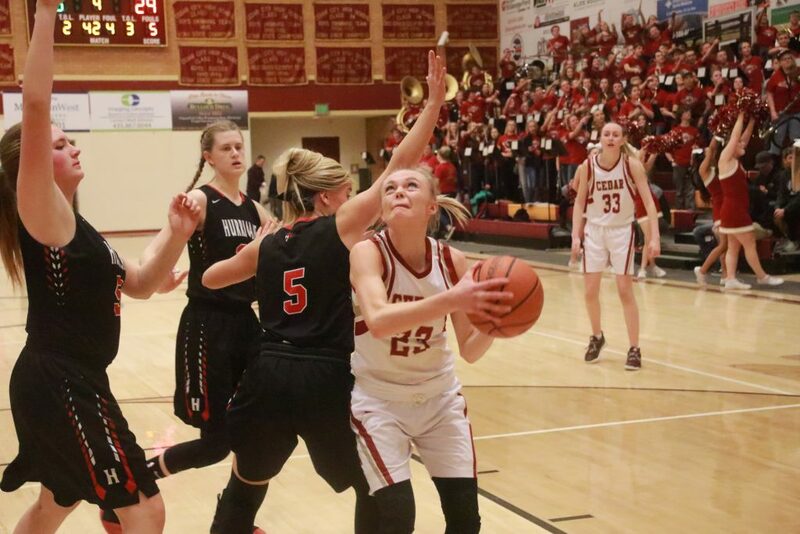 The Lady Reds outscored Hurricane 11-4 in the second period to lead 28-12 at halftime. 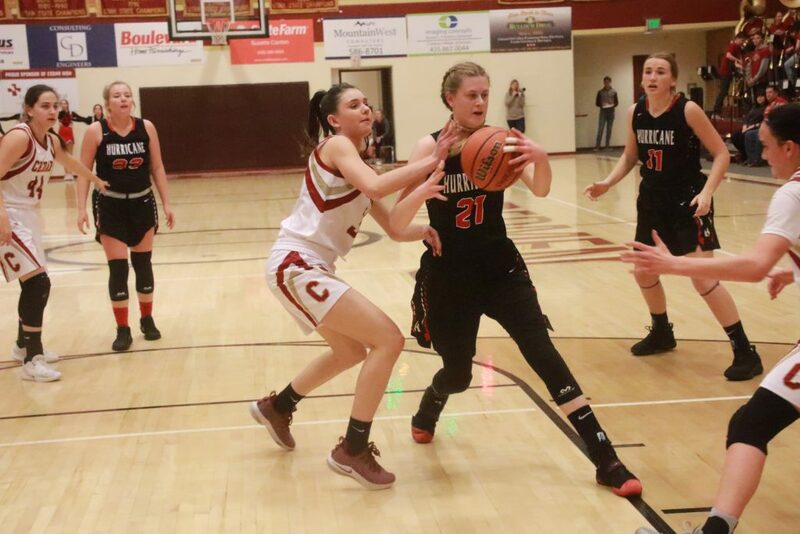 Cedar led 42-21 with just over three minutes left in the third, but Hurricane then went on an 8-0 run to pull back within 13 points. 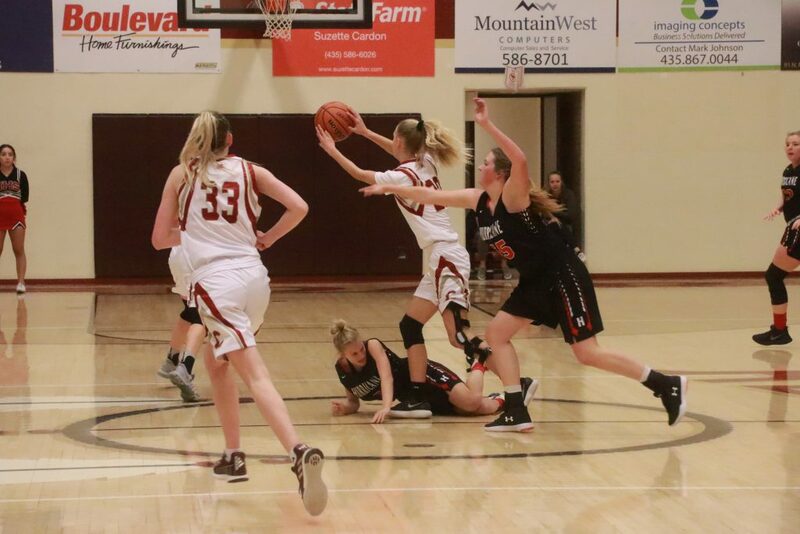 With 6:09 left in the final quarter and Cedar leading by 17 points, 46-29, a fire alarm sounded and the gym had to be evacuated. 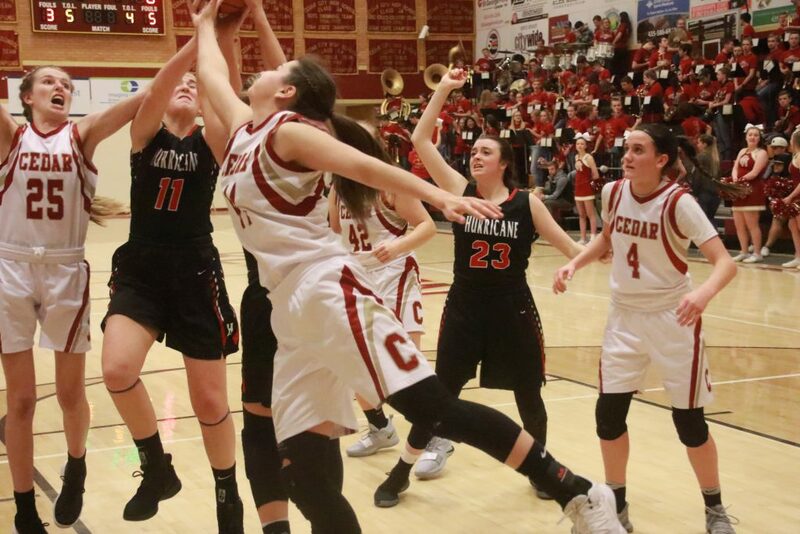 After a delay of approximately 20 minutes, play resumed and Cedar went on a 5-0 run, ending with a free throw by Japrix Weaver that put the Lady Reds on top 51-29 with 2:15 left. 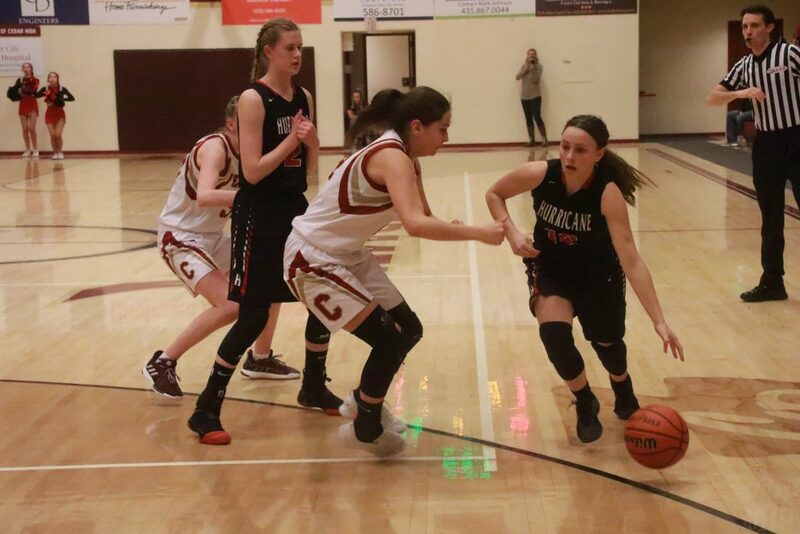 Hurricane then scored the last seven points of the game in the final two minutes, mostly on free throws, to account for the final margin. Cedar head coach Corry Nielsen said he was pleased with his team’s play, despite them missing several close-range shots in the opening minutes. 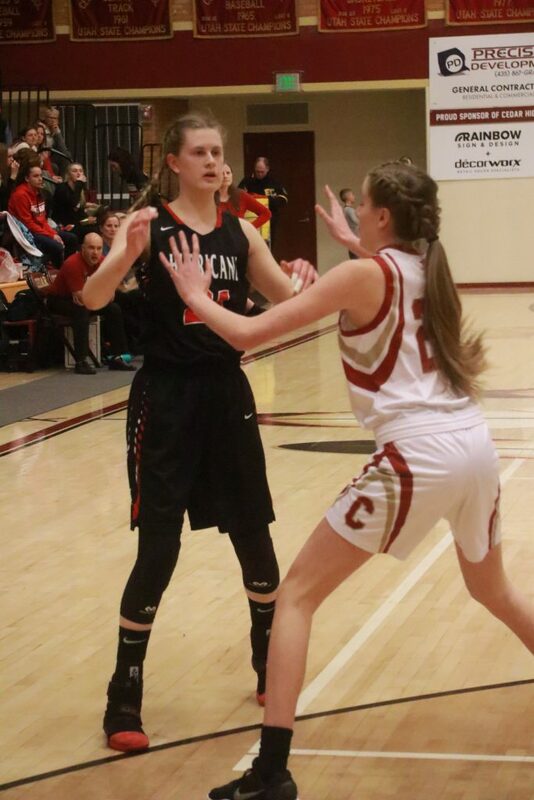 Mayci Torgerson led Cedar’s balanced scoring attack with 12 points, while Samantha Johnston and Denim Henkel each had 10 points and Weaver added 8. Johnston also had a team-high 7 rebounds and five assists. “We play four point guards on the floor at one time, you know, and any one of the four can bring the ball up and do anything. So that kind of causes some mismatches in our favor,” Nielsen said. 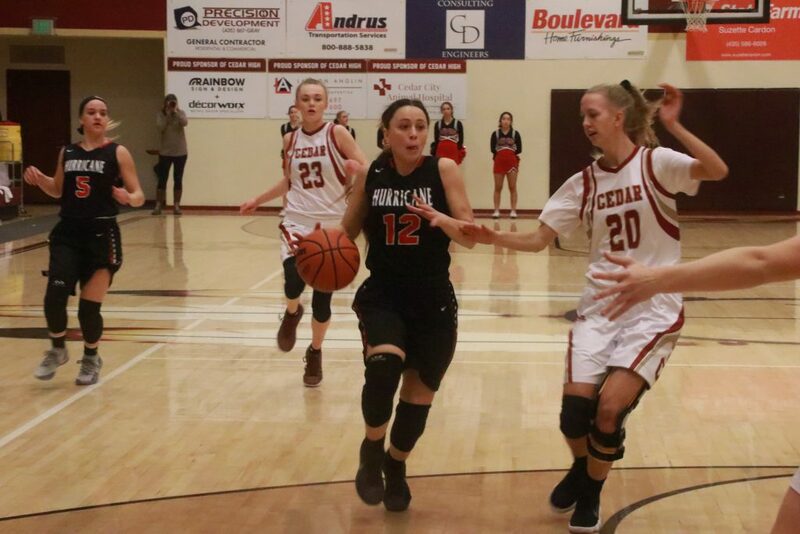 Hurricane head coach Franci Homer said the Lady Reds shot the ball well. 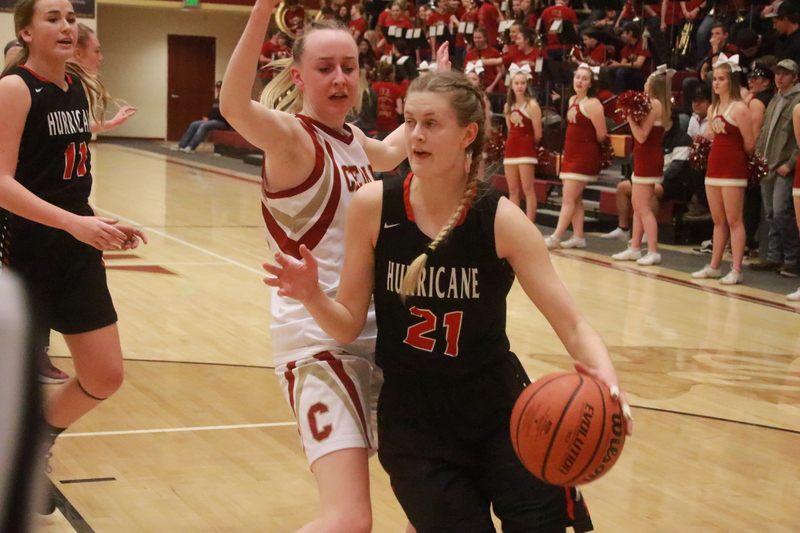 Hurricane was led by forward Hailey Homer’s 15 points, while guard Madi Hirschi added 7. 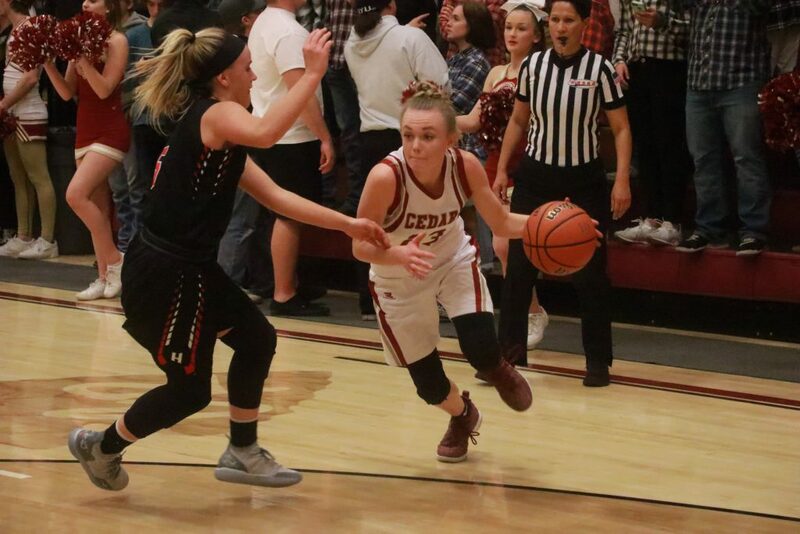 Cedar, which improved to 6-0 in Region 9 play and 15-0 overall, hosts Dixie on Thursday at 7 p.m. Hurricane, which fell to 2-4 in region play, plays at Desert Hills on Thursday at 7 p.m. 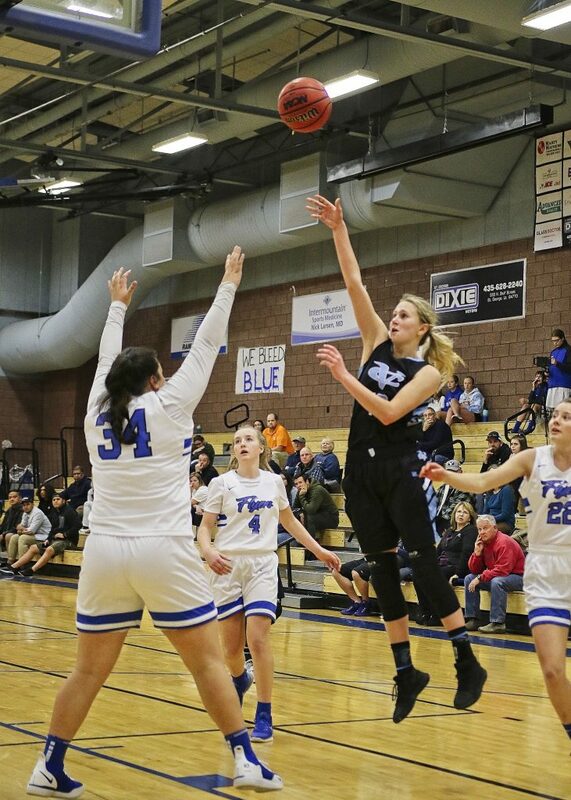 In a back-and-forth battle between Region 9 rivals, the Pine View Panthers completed a fourth quarter comeback for their first region win of the season. After a close first quarter, the Thunder outscored the Panthers in the second, taking a five-point lead into halftime. 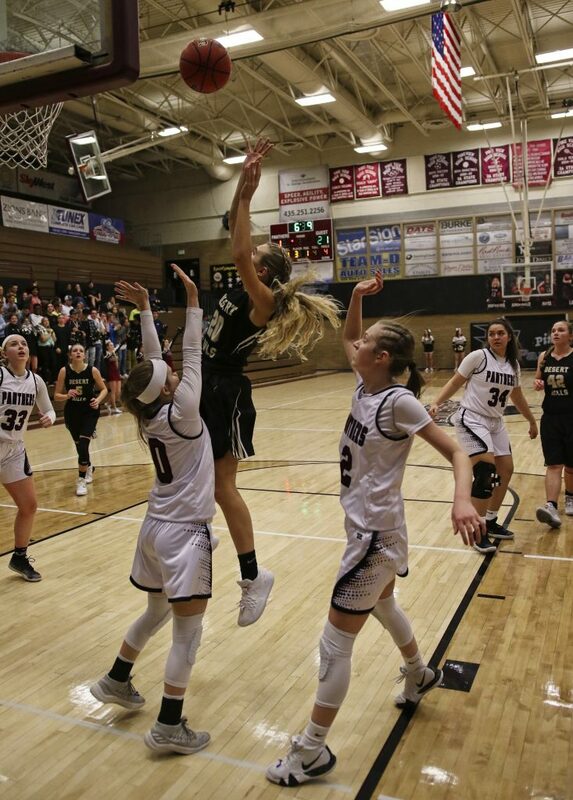 After cutting the deficit to three to start the final period, Pine View clamped down defensively in the last frame, outscoring Desert Hills 16-9 and escaping with a close victory. The loss dropped the Thunder’s record to to 3-3. 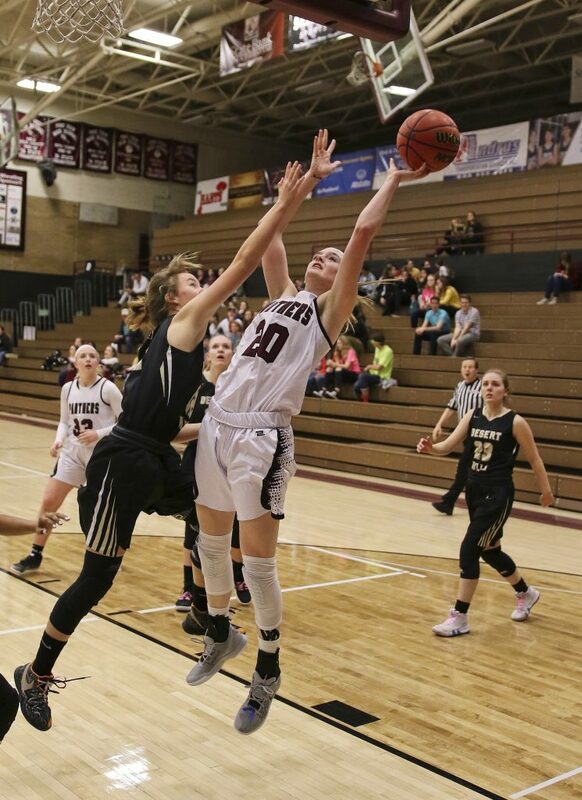 For Pine View, Sophie Jensen dropped 21 points, hitting four three-pointers. 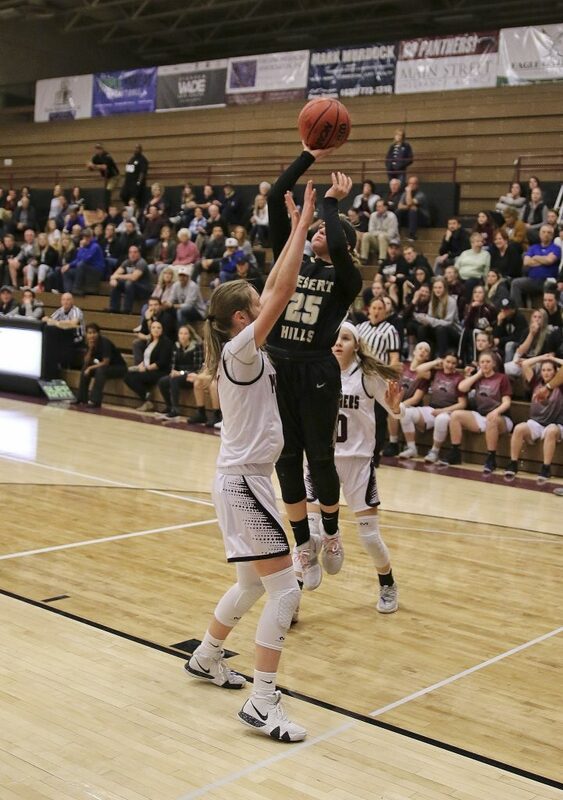 Averi Papa added 13 points for the Panthers. 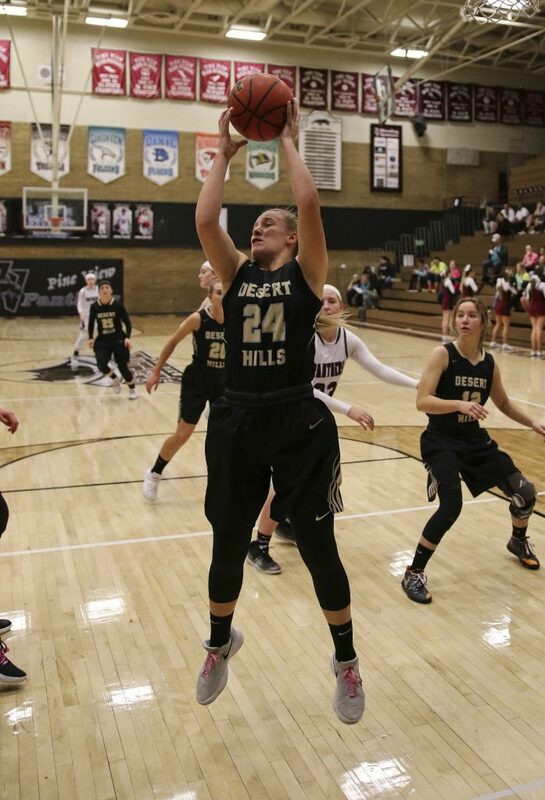 In the loss, Kellie Nance scored 13 points for Desert Hills. 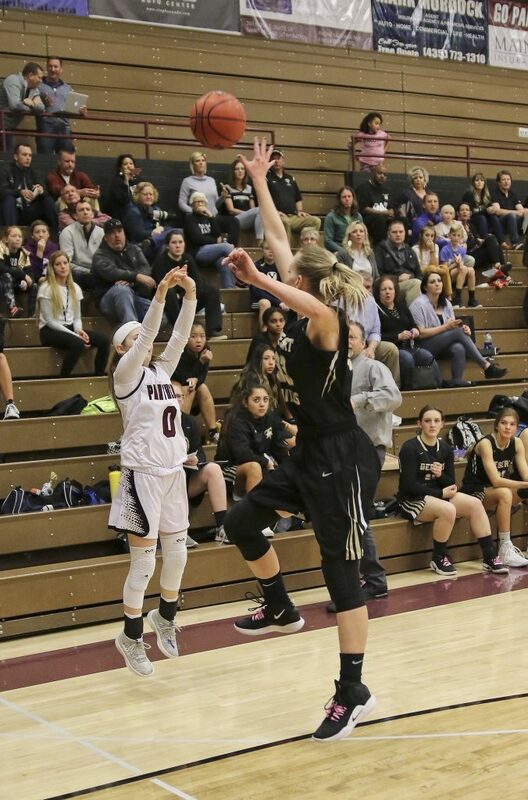 Rachel Myers chipped in 12 points while Julia Jacobsen added 10. The Thunder host Hurricane on Thursday at 7 p.m. The Panthers have a bye on Thursday. 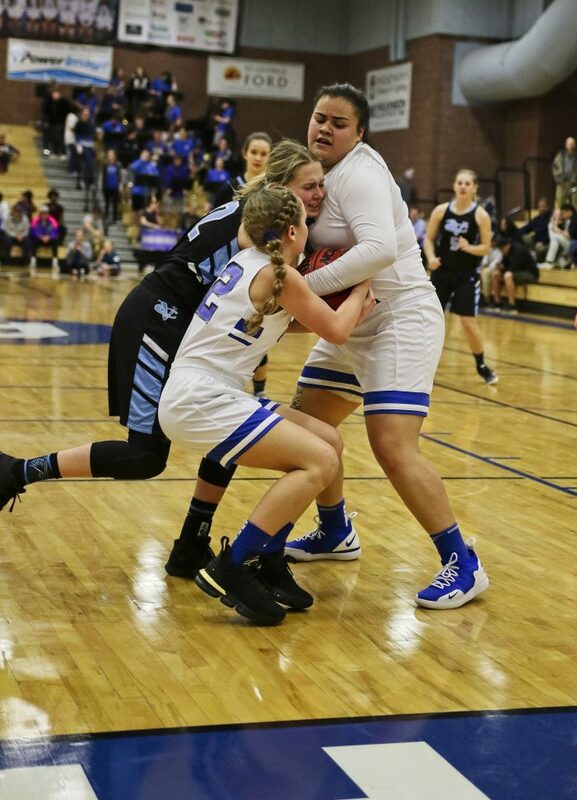 They will look to add another region win to their resume when they visit Snow Canyon on Tuesday. The game will tip off at 7 p.m. 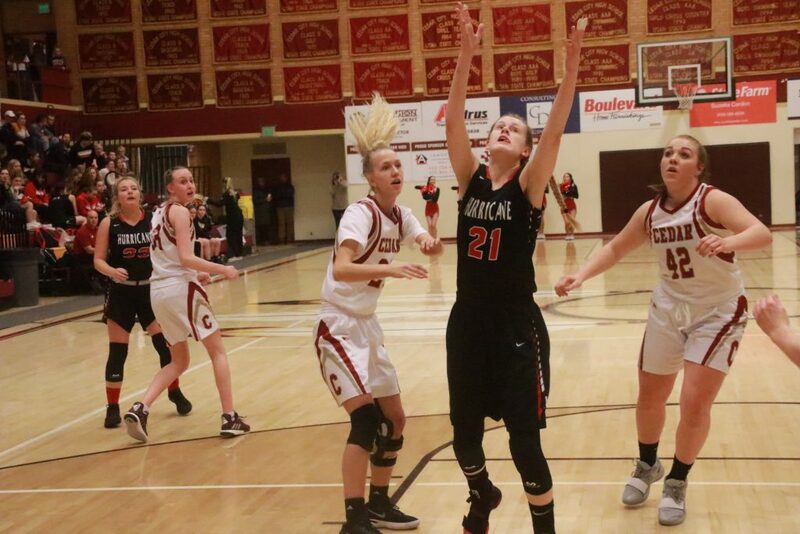 In a close region battle, the Dixie Flyers defeated the Canyon View Falcons. 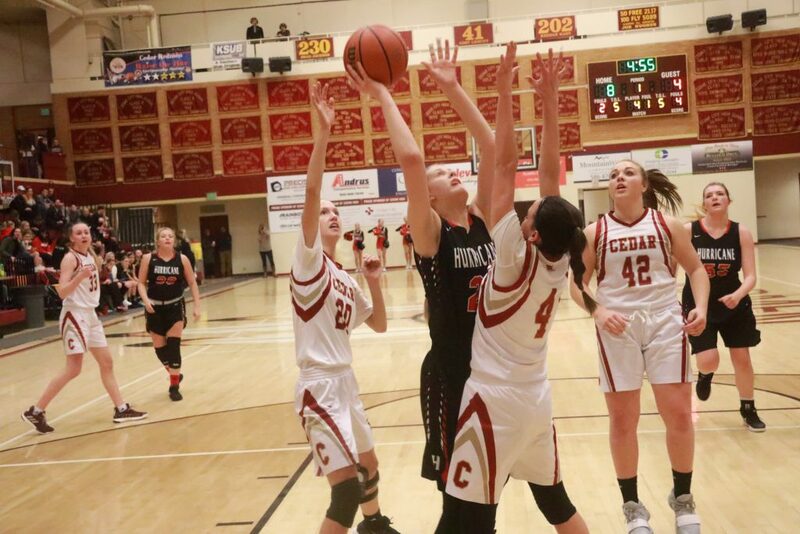 The Flyers took an early lead after one quarter, building an eight-point advantage before Canyon View cut the lead to two at halftime. The game was close the entire second half, but the Flyers held on for the key win. 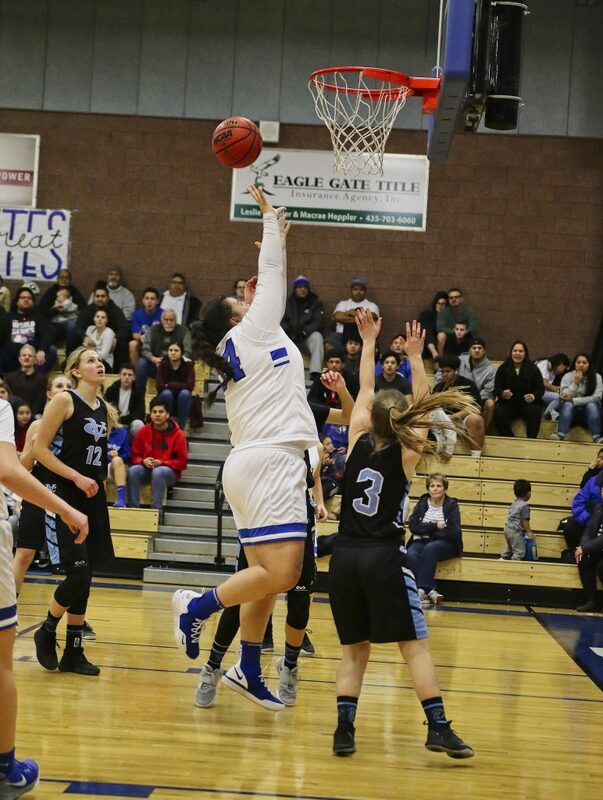 Dixie was led by Sina Tapasa, who scored 15 points and grabbed 7 rebounds. Mel Alo added 8 points, as one of nine Flyers to score in the game. 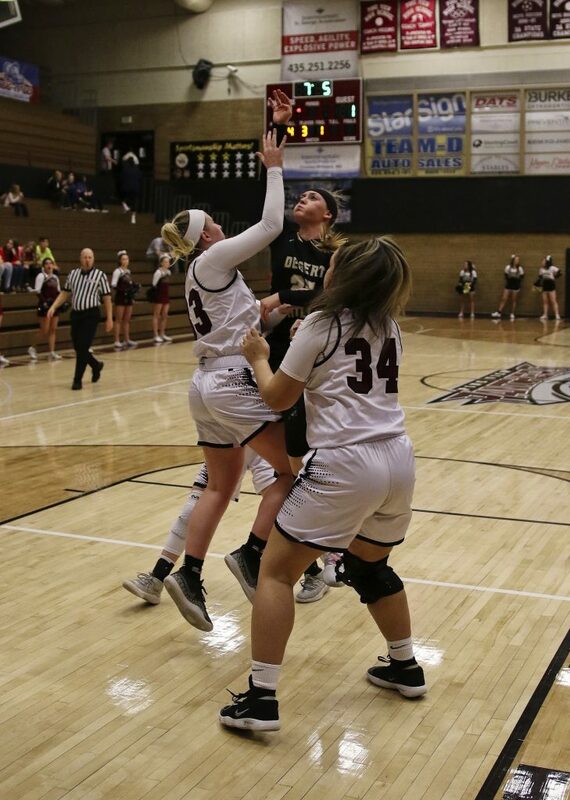 The Falcons were led by Jordan Nielson and Ashlyn Banks, who each scored 13 points. 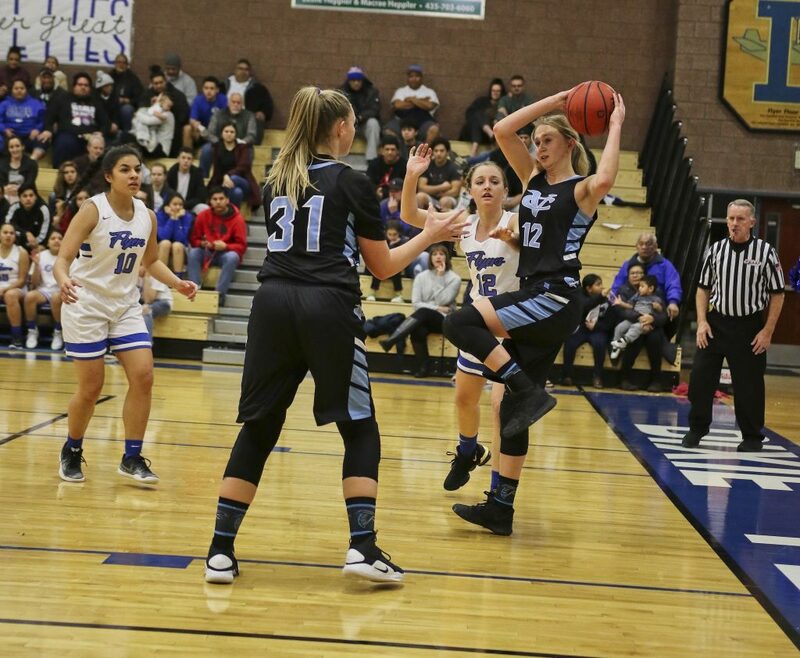 Harlee Nicoll chipped in 11 points for Canyon View. 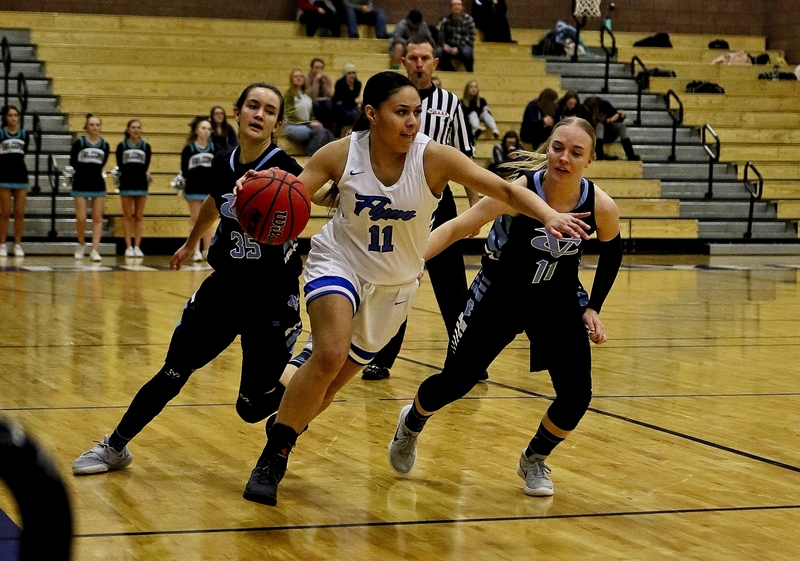 Both teams are back in action Thursday as the Flyers travel to Cedar City to take on the first place Cedar Lady Reds, while the Falcons host Snow Canyon. Both games tip off at 7 p.m.